As an estimated 10 million Mexican free-tailed bats — nursing mothers and their young — began to form into a swirling gyre and rise on a gentle South Texas wind, a small crowd gathered on split-wood benches overlooking the slowly darkening Comal County cave for a lesson in bat ecology and political resistance. There’s a bat battle brewing in San Antonio over sprawl’s potential encroachment on what is believed to be the largest bat colony in the world. With the San Antonio Water System management’s endorsement and an elected city leadership reluctant to intervene, one of the planet’s biological treasures is about to face its most significant eviction risk in its 10,000-year residency. 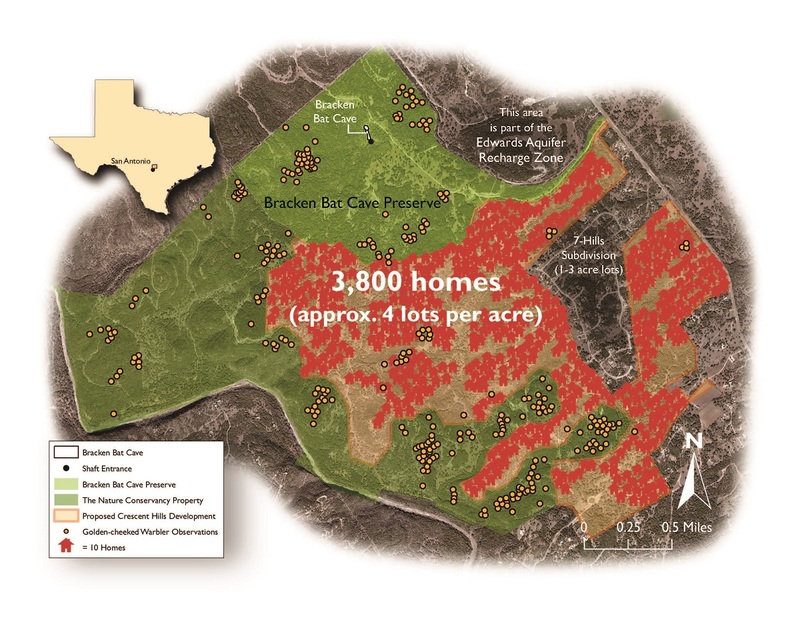 San Antonio developer Brad Galo has plans for 3,800 homes on the south edge of Bracken Cave Preserve, directly beneath the colony’s massive flight path. While SAWS agreed in March to supply water lines to the site (and large enough ones to accomodate future tie-ins from piggy-backing development) so far only orange-ribboned survey stakes are in place. Today, human bat allies cupped their hands to their ears to hear the jittery thrum of tens of thousands of mammalian wings in motion and inhale the equally impressive organic odor of this no-longer-secret hideaway. Children stopped fidgeting, possessed by a marval they hadn’t expected. The only sound is the throbbing of the wings and the occasional high whistle of a small furry body diving through the air like a bottle rocket back into the cave mouth. Nearby air traffic controllers at Randolph Air Force Base were shutting down airstrip operations, says Fran Hutchins (above), Bat Conservation International‘s coordinator for Bracken Cave activities, as they do at 7 p.m. each night in order to avoid potentially costly collisions whenever the bats, which migrate seasonally back and forth between here and Mexico, are roosting at Bracken over the summer. Click image for a slideshow of Friday’s Bracken emergence. Doppler radar will start picking up the snaking bat traffic as the enormous colony — which takes four hours or more to fully evacuate the cave — makes their nightly run deeper into South Texas, says Hutchins. There they will engage another cloud darkening Doppler readings: equally dense fields of corn-earworm moths rising off their favored row crops in a slow summer march north toward Canada. Tonight the Bracken bats will collectively consume 100 tons of agricultural pests. “That’s why they’re so important to the local farmers. If they weren’t eating these bugs – an average female corn-ear moth will lay about 10,000 eggs,” he said. “That kind of money doesn’t matter to politicians?” one woman, one of dozens who has come out on Friday’s summer solstice to learn how to fight off the development threat, asks. “If you take it out of their pocket, it matters. But otherwise it’s out there in the ether,” said Hutchins. But it’s not just the potential loss of economic aid to farmers that concerns BCI, human-bat interactions are sure to increase if the planned subdivision is built. Lights will attract insects to the homes, which will lure in the bats, particularly the young who tend to stay closer to home, leading to conflict. And curiosity seekers would become all-too inevitable as the distance between the bats and humans shrinks. Neither Castro nor any member of San Antonio’s city council have come out to view the bat emergence for themselves, Hutchins said. And yet San Antonio has limited control, said Annalisa Peace, executive director of the Greater Edwards Aquifer Alliance, which is fighting the development for its position atop the porous karst limestone of the Edwards Aquifer’s recharge zone and potential to harm San Antonio’s drinking water. What either SAWS or the City Council can do is immediately revoke the water deal, she said. And they can also push Galo, the lending agency, IBC Bank, and other parties toward a fair-market transfer of the Galo land for additional buffering around the preserve. So far, Galo has offered to sell 15,000 acres to BCI for the jaw-dropping price of $35 million, said Peace. Still another danger is that the entire ordeal will be treated as if it were occurring in a vacuum. So far there is little indication that Castro or others in power see Bracken Cave as emblematic of global patterns that are already dismantling the planet’s very life-support system. In this era of interwoven global crises, it’s a prerequisite when it comes to understanding the value of nature and biodiversity in seemingly local development fights. And it’s a prereq for seeking higher office, too, Hutchins reminds us. “If you believe the reports [Castro] has ambitions other than being a mayor,” Hutchins tells the group. “This is a minor problem compared to being president of the United States. So if you can’t deal with this minor problem compared to ecological problems dealing with the whole entire United States and the world, you might want to consider another job. San Antonio’s Death-Wish: How did we get to this point, where developers have taken the place of farmers over our aquifer’s recharge zone (and farmers took the place of First People)? How did we not realize immediately not to foul our water? The replacement populations are each more damaging than the last to the delicate structure of the recharge zone, putting, among other ridiculous human death-wish materials, impervious cover over a porous system. And the bats. Big red flag. Alarms going off. We are treading sacred ground. Back off. Move away. Save our water. Save our bats. Call on our leadership to purchase the land over the recharge zone. Good article, you get the entire picture and don’t bother with wasting time with printing false statements made by the developers. I wish all environmental reporters would apply ethics and critical thinking skills in their writings. The science is there but it will strategically not be acknowledged by the development community or sold out politicians because it’s in their way. The line given repeatedly is we need more studies. Well, ask a lbrarian or a local academic to aggregate all the peer reviewed journals online where the SCIENTIFIC community agrees that water quality begins to degrade at between 10-15% impervious cover. This community plans to have 4 houses per acre, at that high density that’s upwards of 40 per cent IC. City regulations allows IC to go up to 85% in transportation zones. All of the over sized sewage pipes will be laid in creek beds. Breaks are inevitable and testing costs $37,000 per linear mile. Monitoring and samples are finding high hits of pharmaceutical products in the water, antibiotics, estrogen, anti-depressants, caffeine, pesticide residue, dry cleaning chemicals, yet, Pape Dawson engineering firm and Mayor Castro would have you believe there is no science. * clear cutting, with San Antonio in danger of Non-Attainment status from the EPA for sub-standard air quality that’s a serious economic and public health issue. * Sprawl and associated costs of extending road ways, and maintenance which the rest of the city will be expected to foot the bill. There are plenty of roads in the rest of San Antonio that need repair without subsidizing more sprawl. * Infrastructure and rate inequality due to SAWS rate payers paying for infrastructure laid in this area and charged to the rest of the city. There is a lack of leadership, no local politicians will endanger their political ambitions to champion the environment unless it’s campaign time. There is a lack of creativity and innovation among local engineering firms, and an outdated, wild west mentality among the bureacrats. Let’s rally around the Bracken Cave, it’s our equivalent of Barton Springs! yeah. ‘we need more science’ has been the death of reasoned response since silent spring. thanks for sharing this.